If you're going to brew your first Berliner Weisse, you're as good doing it in the company of 3 Ravens' brewer Brendan O'Sullivan as anyone. He's picked up several awards for his home brewed takes on the style and is the man mainly responsible for the series of tastelessly tasty takes on the style released under Ravens' sibling label Mash Brewing, one of which took out a trophy in WA's awards last year. And that's what Blackman's has done, with brewer Renn hooking up with Brendan as well as a local farmer from Raven's Creek Farm. 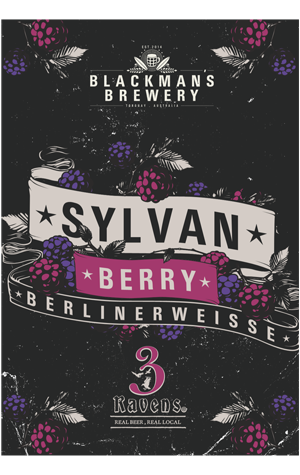 The last of the trio was responsible for the sylvan berries (a type of blackberry) that the beer was aged upon after initially being allowed to sour in the kettle. Renn says it's "light, tart, fruity and incredibly refreshing". More than that, he's apparently rather chuffed to have got Torquay locals drinking a Berliner Weisse as they did at the launch event.